The openSUSE project is a worldwide community program sponsored by Novell that promotes the use of Linux everywhere. After acquiring SUSE Linux in January 2004, Novell decided to release the SUSE Professional product as a 100% open source project, involving the community in the development process. The program provides free and easy access to openSUSE. openSUSE also provides the base for Novell's award-winning SUSE Linux Enterprise products. Beyond the distribution, openSUSE provides a web portal for community involvement. The community assists in developing openSUSE collaboratively with representatives from Novell by contributing code through the open Build Service, writing documentation, designing artwork, fostering discussion on open mailing lists and in Internet Relay Chat channels, and improving the openSUSE site through its wiki interface. Novell markets openSUSE as the best, easiest distribution for all users. 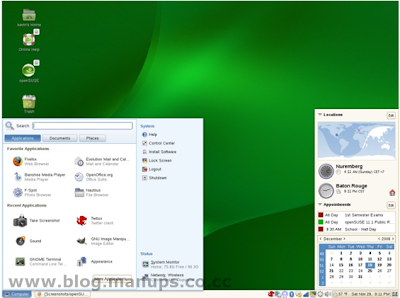 Like most distributions it includes both a default graphical user interface (GUI) and a command line interface option; it allows the user (during installation) to select which GUI they are comfortable with (either KDE or GNOME), and supports thousands of software packages across the full range of open source development. • Make openSUSE the easiest Linux distribution for anyone to obtain and the most widely used open source platform. • Provide an environment for open source collaboration that makes openSUSE the world's best Linux distribution for new and experienced Linux users. • Dramatically simplify and open the development and packaging processes to make openSUSE the platform of choice for Linux hackers and application developers. With the launch of the openSUSE project, openSUSE is now developed in an open model - public development builds, releases, and sources will be posted frequently here and you will have access to our Bugzilla database for defect reporting. You can also sign up on special interest mailing lists to make sure that you are always getting the most recent news on the openSUSE project and the openSUSE distribution. • AppArmor: gives certain applications rights based on how they run and interact with the environment. • YaST: a system management application which openSuSE uses as a Control Center. • Compiz: a 3D desktop that runs on XGL.